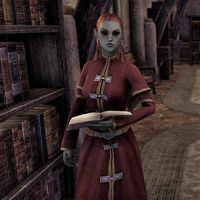 Acolyte Alurue is a Dunmer priest who can be found at the Temple in Suran. "Everyone tries to guess the identity of the Scarlet Judge. But those of us immersed in the mysteries of the Tribunal know the truth." "The Scarlet Judge is obviously our Lord Vivec! Only one of our Living Gods could accomplish what the Scarlet Judge has done." Isn't Vivec busy with his city? "Vivec is the god of justice for all Dunmer, not only those in Vivec City! And the sermons speak of the Warrior-Poet splitting his mind into many bodies. He can oversee the city and dispense justice in equal measure." "Lord Vivec is a poet as well as a warrior. He knows the value of legends and the utility of a subtle touch. It doesn't serve his purpose to make us dependent on divine intervention." This page was last modified on 28 March 2018, at 12:32.